As I said last time, you can listen to the full opera on this At The Opera radio episode, but that’s really no replacement for the full, in-person experience, especially with this opera… So just in case you happen to be in Toronto, Canadian Opera Company is also performing Dialogues this month! And next season, Opera Philadelphia will present it too! Francis Poulenc‘s 1956 opera Dialogues des Carmélites is back at the Metropolitan Opera this season in a rather famous 1977 John Dexter production, but for only three performances. It was well-reviewed though, and tonight you can hear it live streamed starting at 7:25pm. 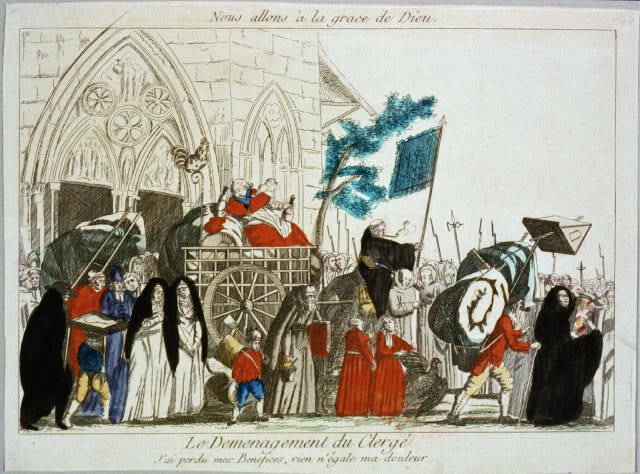 The opera is based on a true story of the French Revolution, when 11 Carmelite nuns and their associates from Compiègne in Northern France, were arrested and executed for defying the Civil Constitution of the Clergy, meant to be the last nail in the coffin of monastic orders in Revolutionary France. Their execution was famous because as they went to the guillotine, they sang a hymn, inspiring the opera’s famous last scene. Apparently this set of strips was so popular (even more so than earlier lesbian kiss-themed strips) that it prompted a new evolution-themed t-shirt from Willis, available here.